1911 - William T. Hornaday informally conceives the idea of an independent endowment fund to supply monies to finance ongoing battles against big business and others for the protection of wild life around the world. 1913 - William T. Hornaday formally creates the Permanent Wild Life Protection Fund and decides that it will take no less than $100,000.00 to fully endow the fund. It has three trustees of which two are bankers and William T. Hornaday as the third. Dr. Hornaday is referred to as the "Campaigning Trustee". All donors of $1,000.00 or more are referred to as "Founders". Dr. Hornaday has total control on how the funds are used. 1914 - Dr. Hornaday sends a proposal to the Boy Scouts of America offering to provide them with a yet to be created medal for members who provide "distinguished service" for the protection of wild life. The BSA itself will select its recipients through its Courts of Honor. Even though the BSA will make the initial selection the nominees still have to be approved by the three Trustees of the P.W.L.P.F. and a number of them that were submitted by the BSA were not approved by the P.W.L.P.F. Trustees. The medal will be an award of the P.W.L.P.F. and not a BSA created program. The Badges and Awards committee of the BSA begins an extensive process to consider the offer. 1915 - The P.W.L.P.F. Wild Life Protection gold medal program is formally created. By March 15th, 1915 "After long and careful deliberation" the Badges and Awards Committee of the BSA approve and accept the P.W.L.P.F. 's offer. A New York jeweler named J. Newman is commissioned by the P.W.L.P.F. to create the medal and work begins. The Biennial Statement of the Permanent Wild Life Protection Fund 1913-1914 is published in March 1915 and mentions the awards program and that although originally conceived with the BSA in mind, it will be made available around the world to promote the protection of wild life. It is also stated that the medal is in the design stage at that time. The goal of $100,000.00 in funding to endow the P.W.L.P.F. is reached with a balance of $104,750.00. On August 25th the first medal is delivered as a sample to Dr. Hornaday by the Newman Jewelers. Dr. Hornaday is extremely pleased with the design and workmanship. There was originally three different designs proposed. One of them had a quail on the medallion and the third is unknown although if you look at the early award certificates they had quail and buffalo on them. My personal guess is that the third design had a buffalo on the medallion but again, that is pure conjecture. 1916 - The J.F. Newman Company on March 2nd sends a bill for creation of the die to make the medals and the one sample medal previously delivered. The die costs $100.00 to make and the cost of the medals is estimated to be $75.00 each. Dr. Hornaday writes back asking that the price include engraving of names and the price be lowered to $60.00 each. A compromise is made and the price is set at $65.00 each. 1917 - On May 15th the first four P.W.L.P.F. medals are ordered by Dr. Hornaday from the J.F. Newman Jewelers at a cost of $65.00 each. Based on the price, it appears that the early medals were pure gold. The medals are made each year only as needed. The very first P.W.L.P.F. "Wild Life Protection Medal" is presented on June 29, 1917 to Margaret Olivia Sage, who had purchased the 76,000 acre Marsh Island in the Gulf of Mexico for use as a bird sanctuary and who also had donated $25,000.00 to the P.W.L.P.F., making her its largest donor. She is the richest woman in America and has no connection to the BSA. Three other medals are awarded in 1917 by the P.W.L.P.F., including the second one to naturalist Aldo Leopold. The other two medals are awarded to Dr. T.C. Stephens and Drew Standrod, both non-members of the BSA. 1918 - The P.W.L.P.F. makes its medal available to the Peoples Home Journal Magazine who through a national bird sanctuary campaign among its readers, awards four P.W.L.P.F. gold medals that year to four individuals including a young girl. None of them are members of the BSA. The Newman Company raises the price of the medals to $75 each which greatly displeases Dr. Hornaday. 1920 - Lenhardt Bauer, a nine or ten year old boy in Terre Haute, Indiana, is awarded the P.W.L.P.F. Gold Medal. He is not a member of the BSA. 1921 - The BSA appoints a committee to revise its requirements for the P.W.L.P.F. Medal because Dr. Hornaday thinks the BSA requirements are too difficult for a boy to achieve. To date, no member of the BSA has been awarded the P.W.L.P.F. Gold Medal. The price of the medals is raised to $80.00 each by Newman Jewelers. 1922 - The BSA awards for the first time a P.W.L.P.F. Gold Medal to one of its members, Scoutmaster Harry Hall of Carbondale, Pennsylvania. The P.W.L.P.F. Gold Badge is created and awarded to four members of the BSA. According to Dr. Hornaday's 1931 P.W.L.P.F. awards history, a fifth person, a non-BSA member also is awarded the badge. However in an April 11th letter to Newman Jewelers, Dr. Hornaday gives them the names of nine people who are badge recipients for 1922 besides the four BSA badge recipients. The Gold Honor Badge is also an award of the P.W.L.P.F. and is presented outside of Scouting as well. Twenty five gold badges are ordered from Newman Jewelers, so presumably 25 were awarded in 1922. The P.W.L.P.F. Gold Medal is presented for DISTINGUISHED Service and the P.W.L.P.F. Gold Badge is presented for VALUABLE Service. In 1922 the P.W.L.P.F. withdraws the Gold Medal from BSA consideration for boy members and makes it available only to scoutmasters and other adults in Scouting. 1926 - The second P.W.L.P.F. medal to go to a member of the BSA is awarded. It is awarded to an Eagle Scout who is not listed on the National BSA records but is on a list of recipients that Dr. Hornaday published in 1931 when he wrote a history of the P.W.L.P.F awards program. (Keep in mind that adults could earn the Eagle rank at any age. It was decades later before the age 18 limitation was put in force.) Dr. Hornaday retires from the New York Zoological Park after 30 years service. 1929 - The third P.W.L.P.F. medal to go to a member of the BSA is awarded. It is presented to longtime Cincinnati, Ohio Scout Executive Arthur Roberts who also founded the Tribe of Ku-Ni-Eh camp society. 1931 - Dr. Hornaday writes and publishes a history of the P.W.L.P.F. awards program. 1934 - The fourth P.W.L.P.F. medal to go to a member of the BSA is awarded. 1936 - The fifth and final P.W.L.P.F. medal to go to a member of the BSA is awarded. 1937 - Dr. William T. Hornaday dies on March 6, 1937 at Stamford, Connecticut. Per the original 1913 provisions of the P.W.L.P.F., its assets are bequeathed to the New York Zoological Society to create their conservation endowment. The BSA begins negotiations with the N.Y.Z.S. to continue the P.W.L.P.F. awards program, perhaps as a memorial to Dr. Hornaday. No medals or badges are awarded in 1937. 1938 - It is announced that an agreement has been reached between the BSA and the N.Y.Z.S. to continue the awards program of the now defunct P.W.L.P.F.. It will now be sponsored by the N.Y.Z.S. and will henceforth be awarded as and called the "Hornaday Awards" in honor of the late Dr. Hornaday. 1939 - The first "Hornaday Badges" are presented by the BSA to five of its members. 1941 - The very first official "Hornaday Medal" is awarded by the BSA. The original medal of the P.W.L.P.F. continues to be used with the words "Hornaday Award" being inscribed on the back of the medallion. It is presented to an Eagle Scout in Harrisburg, Pennsylvania. 1943 - The second "Hornaday Medal" is awarded by the BSA. It is presented to a Scouter in Toledo, Ohio. His medal was donated to the Camp Miakonda Scouting Museum in Sylvania, Ohio where it remains on display. 1945 - The third "Hornaday Medal" is awarded by the BSA to a Scout in Ohio. 1949 - The fourth and final Type I "Hornaday Medal" is awarded by the BSA to an 18 year old Eagle Scout in Rhode Island. 1950 - The last of the Type I Hornaday Badges are awarded. Six individual badges are presented. 1951 - No individual medals or badges are presented. The first Hornaday Unit Award is presented to a troop in Bristol, Virginia. 1952 - The totally redesigned (Type II) Hornaday Awards are presented for the first time. Seven medals are presented as are fourteen badges to members of the BSA. The design features remain unchanged as of 2002. 1966 - The 1966 BSA Annual Report to Congress includes a "Historical Highlights" timeline section that states under the year 1914, "the first William T. Hornaday gold medal for conservation of wildlife was presented". This statement, although totally incorrect, is quoted as fact for the next thirty six years. Whoever entered the date may have inverted the last two digits of the correct year 1941 which would then incorrectly be 1914. At some point, the BSA also starts using an incorrect date of 1938 for Dr. Hornaday's death instead of the correct date of March 6, 1937. The 1937 Annual BSA Report to Congress did in fact state that Dr. Hornaday died in 1937. These two pieces of misinformation are widely quoted on the internet and in printed material up to the present time (2002). 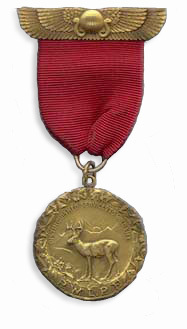 The first "Hornaday Medal" was awarded in 1941 and the predecessor medal, the Wild Life Protection Medal of the Permanent Wild Life Protection Fund was first awarded on June 29, 1917 and the first member of the BSA to receive the original P.W.L.P.F. medal was presented it in 1922. The BSA Historical Highlights timeline is repeat printed in a number of BSA Annual Reports to Congress through the years with the 1914 date and quoted on the official BSA website as of 6-2002. 1970's - The New York Zoological Society ends its sponsorship of the Hornaday Awards program and the Dupont Company assumes it. Sources of data for the above information came from the archives of the Bronx Zoo, the Library of Congress and the Rockefeller Archive Center. Information was also drawn from various other sources including Annual BSA Reports to Congress from 1920-1976, unpublished letters to and from William T. Hornaday and the very early biennial Statements of the Permanent Wild Life Protection Fund. Also from Ruth Crocker, author of "Splendid Donation: A Life of Margaret Olivia Sage" (Indiana 2003) and from Baltimore collector Paul Kramer who happens to be one of the initial seven 1952 recipients of the Type II Hornaday Medal as well as a longtime collector of Hornaday memorabilia. Scans were supplied by the Camp Miakonda Scouting Museum.